Drawing from his nearly 30 years of experience and research, CJCJ Executive Director Daniel Macallair has written a ground-breaking new book on the history of the California youth corrections system. Weaving together a compelling and incisive story about the nation's largest youth corrections system, Macallair lays bare the daily reality of institutional life — including 150 years of scandal, public outrage, and failed reforms. From the opening of the San Francisco Industrial School in 1859 to the establishment of the California Youth Authority (CYA) in 1943, California's juvenile justice system found itself in a perpetual search for an effective institutional model. The CYA in the 1950s and 1960s achieved an international reputation as a progressive voice in youth corrections, through its introduction of individual and group therapy, and vocational training programs. However, despite the continued hope of California's leaders that newer and better designed facilities would allow the juvenile justice system to achieve its lofty goals, decades of uninterrupted abuse, neglect, and mismanagement revealed the image of effective institutional care, carefully crafted by the CYA, was just an illusion. Daniel Macallair's research was commissioned by the California State Assembly Public Safety Committee, and is the most comprehensive history of California's youth corrections system to date. On September 12, the San Francisco Juvenile Probation Department (SFJPD) hosted the first annual Polynesia Violence Prevention Day. 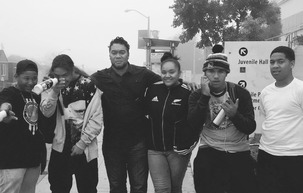 Youth on probation and their families gathered with community service providers, including CJCJ, to support youth in completing their programs while connecting to their Polynesian heritage. The event was modeled on CJCJ's Probation Enrichment Program (PEP) curriculum, which uses cognitive behavioral therapy and interventional techniques to serve youth on probation. PEP also cultivates a sense of community identity and responsibility. At the event, CJCJ's Director of Juvenile Justice Services, Kimo Uila, facilitated a small group discussion with the youth. The group members were guided to reflect on their dreams and life goals, past and present, and analyze how completing probation would help achieve these goals. The small group also discussed Polynesian heritage and understanding culture as a source of pride that can help youth be successful in their communities. "If you know who you are and you have strong belief in yourself, it doesn’t matter where you go—you will be able to thrive," says Kimo. "I think they realized they do have an identity, they're not just products of their environment, and their crime doesn't define them. Understanding their own culture will help them navigate the different cultures in their communities." The Monterey Bay Central Labor Council,Motivating Individuals through Public Advancement (MILPA), and The Village Project co-sponsored a town hall meeting on September 10 to discuss the local and statewide implementation of Proposition 47. Local elected officials, community leaders, and neighbors in Monterey County's City of Seaside gathered inFriendship Baptist Church to hear presentations from five panelists, including CJCJ Director of Policy and Development Brian Goldstein, Californians for Safety and Justice, MILPA, the Monterey Bay Central Labor Council, and the Monterey County Public Defender's Office. 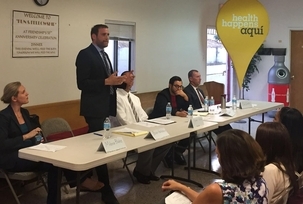 CJC's Brian Goldstein presented on the significant state savings anticipated through Proposition 47, and how that money would be reallocated. Specifically, he explained that California's Board of State and Community Corrections (BSCC) has been tasked with distributing 65 percent of these savings to programs that reduce recidivism. This November, the BSCC will create a committee to begin the process for recommending how funding is allocated. "It's very important that local community members engage with the BSCC," says Brian. "Community-based programs have been historically effective at reducing recidivism through mental health and drug treatment, employment, and supportive housing. The state should prioritize funding these programs and ensuring that the communities most impacted by our justice system lead these decisions."